In case of plain break oil circuit breaker, the arc is controlled only by increasing the length of the arc. In such circuit breakers, movement of the oil into contact space is increased by the use of pressure developed by arc itself. The high pressure produced by the arc causes an immediate flow of oil into space between contacts after the arc current goes to zero. It is a rigid cylinder of insulating material which surrounds the fixed and moving contacts, closed at the top but with a narrow opening, known as the throat, at the bottom. The moving contact is a cylindrical rod passing through the throat. When a fault occurs, the contacts separate, an arc is struck between them and oil is decomposed into a gas (mostly Hydrogen) at a very high pressure in the pot, due to the heat of arc. The high pressure forces the oil and gas around the arc to extinguish it. This type of pot cannot be used either for very low or very high currents. On low fault currents, the pressure developed is small which increases the arcing time. On the other hand, on large fault currents, the gas is produced so violently that pot may burst due to high pressure. Thus the breaking capacity of this type of pot is limited. This pot is just a modification of plain explosion pot and shown in the figure. It is made of insulating material and has channels on one side which acts as arc splitters. These arc splitters lengthen the arc and also provide cutting edges across which arc is weakened and finally interrupted. When the contacts of the pot are ejected, oil movement is checked by arc pressure itself until arc current goes to zero. When a fault occurs, the moving contact of breaker separates, and due to this separation of contacts, the arc is initially struck in the top of the pot. The gas produced by the arc exerts pressure on the oil. When the moving contact uncovers the arc splitters ducts fresh oil is forced across the arc path. Thus the arc is driven sideways into the arc splitters which increase the arc length, causing arc extinction. The cross-jet explosion pot is very suitable when heavy fault currents are to be interrupted. But gas pressure developed is small on low fault currents and consequently, pot operation is not satisfactory. Therefore, cross-jet explosion pot based self-blast oil circuit breaker is suitable for interrupting heavy currents at high voltage (66 kV). Such a pot is shown in the figure. It consists of two chambers. The upper chamber is cross-jet explosion pot with two lateral orifices while the lower is plain explosion pot. As it is a combination of the plain explosion pot and the cross-jet explosion pot. Therefore, it operates very well at heavy currents and low currents. poor performance with fault currents considerably less than rated current. It is due to reduced generation of gas at low fault currents. This problem is eliminated in forced blast oil circuit breakers in which pressure is developed by the external mechanical system. In these circuit breakers pressure developed is independent of the fault currents to be interrupted. 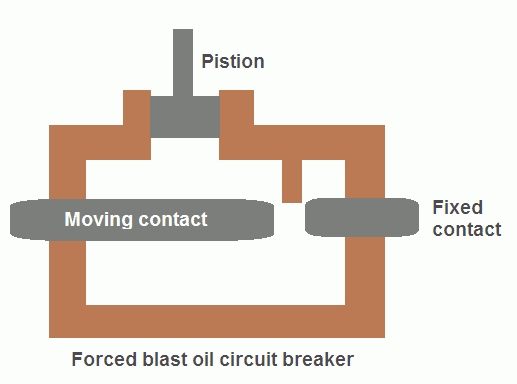 In forced blast oil circuit breaker, the oil pressure is created mechanically by the piston-cylinder arrangement. The movement of the piston is mechanically coupled to the moving contact. Thus when circuit breaker operates, oil pressure is generated automatically and the arc is interrupted at high speed. At low currents, the performance of such breaker is more consistent than self-blast oil circuit breaker since oil pressure is independent of fault current. One more advantage of this design over the self-blast oil circuit breaker is that the quantity of oil required is reduced to one-quarter.